"Fritos® and chili! This was a real favorite when I was a kid, and it still is. With the Frito-Lay® Company being based in Dallas, this dish is about as Texan as you can get." Spread about 2 cups corn chips in a baking dish. Sprinkle half the onion and half the Cheddar cheese over chips and top with chili. Spread remaining 1 cup corn chips over the chili, followed by remaining chopped onion and cheese. Bake until hot and bubbly, 15 to 20 minutes. 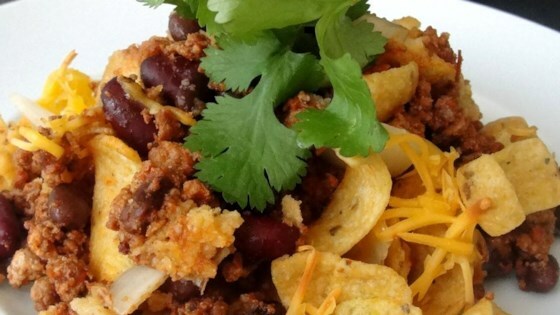 I have never heard of a baked Frito pie, I always just put Fritos in a bowl and cover with chili, cheese and onions, often adding jalapenos, diced tomatoes a dollop of sour cream. I have made it for years. I just crush my fritos and add my heated chili and cheese. I also love chopped tomatoes on top.